Alumina ceramic balancing beads seem to be gaining in popularity as an alternative to more traditional wheel balancing techniques, in particular for truck and bus wheels. In a recent case the in-service failure of a steer tire was attributed to inner liner penetration by one of these beads. An objective evaluation of the feasibility of the claim was prompted. A 385/65 R22.5 160K/158L highway pattern steer axle truck and bus tire failed suddenly and catastrophically in service, causing the driver to lose control of the vehicle. The tire had been in linehaul service on the left steer axle position of a Mack Superliner for approximately three months, during which time it had traversed approximately 71,000km. 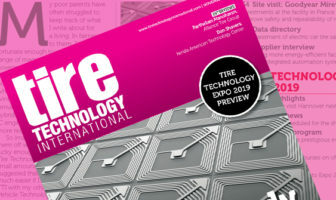 A detailed inspection of the failed tire was made, and several observations about its condition, operational and maintenance factors, and manufactured quality. A single ceramic ball of 4mm diameter had indeed become lodged in one of several inner liner fractures. How could that have happened? Was it the factor that initiated the failure? Ceramic balancing beads had been used in the tire from the day it was fitted to the subject prime mover as a new tire. The mass of beads required for a given size tire (in this instance 454g) had been supplied pre-packaged in a thin polyethylene bag, which was in turn packaged in a thicker zip-lock bag. The fragile inner bag was designed to be placed into the tire cavity at the time of tire fitment, with its subsequent rupture inside the inflated tire during the first few service revolutions releasing the beads. A failure analyst had postulated that the balancing bead had been ‘drilled’ into the inner liner, leading to intra-carcass pressurization and subsequent catastrophic tire failure. The analyst proposed that the double-bagged beads had been inadvertently placed inside the tire (rather than just the thin inner bag of beads), and that a single bead had been impacted by the full bag of beads at a rotational speed corresponding to 100km/h. 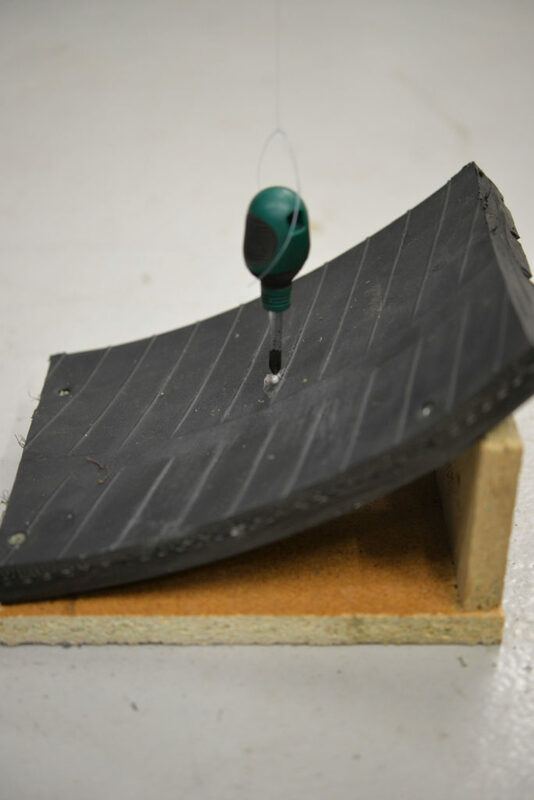 This impact was said to be sufficient for the single bead to fracture the tire inner liner where it became lodged, initiating the failure sequence. Calculations determined that the ‘worst possible case’ was an impact force of 195J at an impact angle of 24.3°. From a drop height of 4m, a 195J impact force requires a mass of 4.97kg. 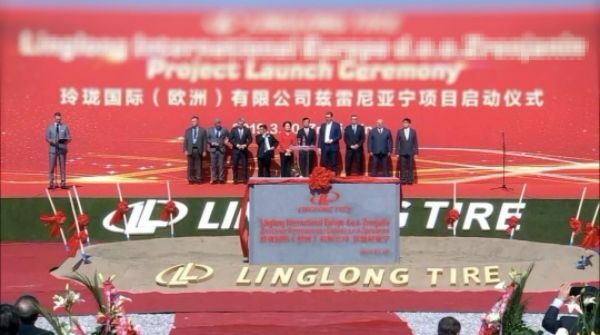 Supplies of pre-packaged ceramic balancing beads, identical to those used in the subject tire, were sourced. A random sample of statistically significant size (n=30) was taken from the population of beads, and their diameters measured in order to determine the distribution of bead sizes. The data was found to be approximately normally distributed with a mean of 4.04mm, a standard deviation of 0.22mm, and a minimum of 3.69mm. A worn tire of the same brand, size, pattern and production plant was sourced. A 200mm x 160mm section of the crown was excised from the tire and mounted on a timber support frame at the calculated angle. 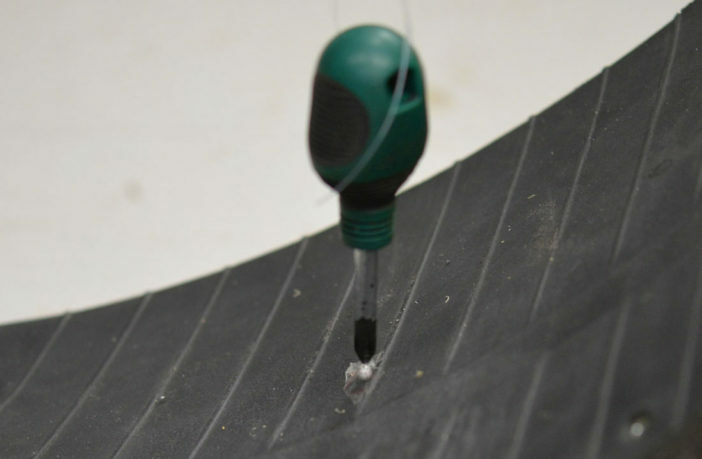 A single ceramic balance bead (diameter 3.7mm) was centrally attached with a single layer of Sellotape to the surface of the inner liner of the test piece (see Figure 1). A vinyl bag with a base dimension of 70mm x 150mm was designed and fabricated, the underside of which was attached to one side of an outer zip-lock bag containing a 450g (thin) bag of ceramic beads. Lead shot – which instantly conforms to the random upper surface arrangement of the bead bag without imparting concentrated impact loads – was selected as the ballast, and was added to the upper vinyl bag until the mass of the assembly was 4.97kg (see Figure 2). The test assembly was suspended at a height of 4m directly vertically above the center of the test piece, with confirmation of its location relative to the single ceramic ball made using a plumb line. Video cameras were set up to record the tests. 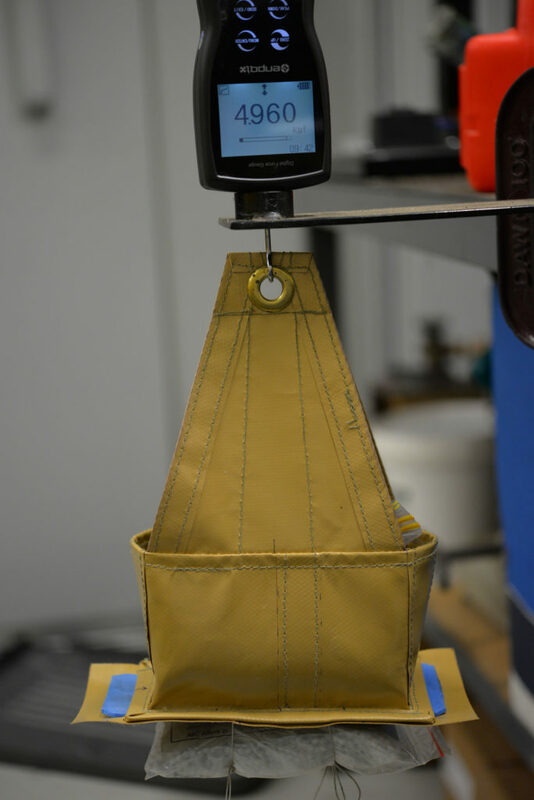 The bag assembly was released and allowed to freefall under gravitational force, impacting the single ball on the inner liner of the tire test piece. The test was repeated six times: three times with the large side of the bag striking the liner, and three times with the end of the bag striking the liner. On none of the tests did any of the balls penetrate the liner. In every case both the inner and outer bags ruptured on impact. After six impacts the liner was unblemished (see Figure 3). It is clearly not possible for a flexible bag of ceramic beads to impart a force on a single bead sufficient to cause that bead to fracture the inner liner of the truck tire. Almost self-evidently the beads in the bag will move on impact such that the surface of the bag deflects to envelope the single bead. 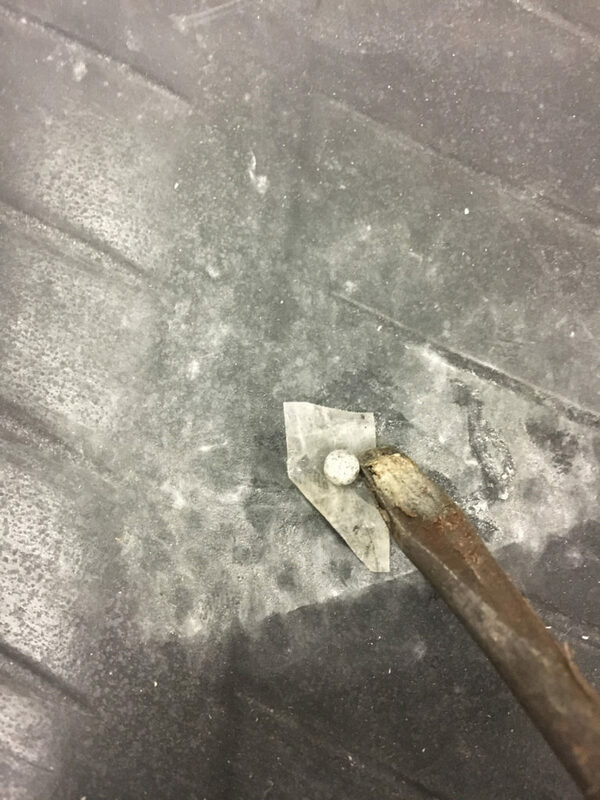 In an attempt to understand the type and magnitude of the force required to ‘drill’ a ceramic bead through the inner liner, a 3.7mm bead was placed on the test piece and repeatedly struck approximately perpendicularly with a 3kg hammer, using as much force as the author could muster. The bead did not penetrate the liner. This process was also videotaped. The proposition that a bag of beads had impacted a single bead causing it to fracture the inner liner was not supported. There is no credible basis for the proposition offered by the failure analyst. David Southwell is an independent consultant to the tire industry based in Australia. 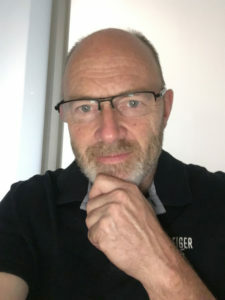 He has more than 30 years’ experience working with automotive OEMs in design, development, production, quality, technical training, field performance and failure analysis roles with various tire manufacturers and retreaders in the Asia-Pacific region. Southwell’s expertise spans passenger car, light truck, and truck and bus tires, and he holds a master’s degree in engineering.